Every precious metal has its own delicate sheen, which is a reflection of its purity but this purity needs to be validated through testing, or in technical terms-Assaying. Assaying is thus defined as the process of determining precious metals content in an alloy. This scientific process, which requires thorough training, is a much-sought-after profession in the jewellery industry. 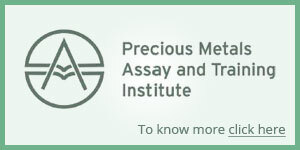 Anticipating this booming demand for professionally trained assayers in India, the Indian jewellery industry has launched a one-of-its-kind initiative in the form of the Precious Metals Assay and Training Institute (PMATI) – a not for profit joint venture between the World Gold Council and MMTC-PAMP Pvt. Ltd. The first and the only assay training institute in India, PMATI will provide formal training and certification for the assaying of precious metals like gold, thereby offering its students a unique opportunity to make a career in precious metals assaying. Upon completion of all different course modules, one can become a certified assayer and secure an exciting career for life. Why you would want to be a part of PMATI? Formal course curriculum developed by India's finest academic institutions. Campus infrastructure at Indian Institute of Gems and Jewellery (IIGJ). Fresh B.Sc. Chemistry /B.Sc. Physics / Diploma Chemical / Diploma Metallurgy student. Graduate in any discipline or 12th science with minimum 1 year of working experience in Precious Metals Industry. Precious Metals Assay and Training Institute, IIGJ Andheri Campus, Bagmal Laxmichand Parikh Campus, Plot No. 111/2, 13th Road, M.I.D.C. Andheri (E), Mumbai - 400 093, India.